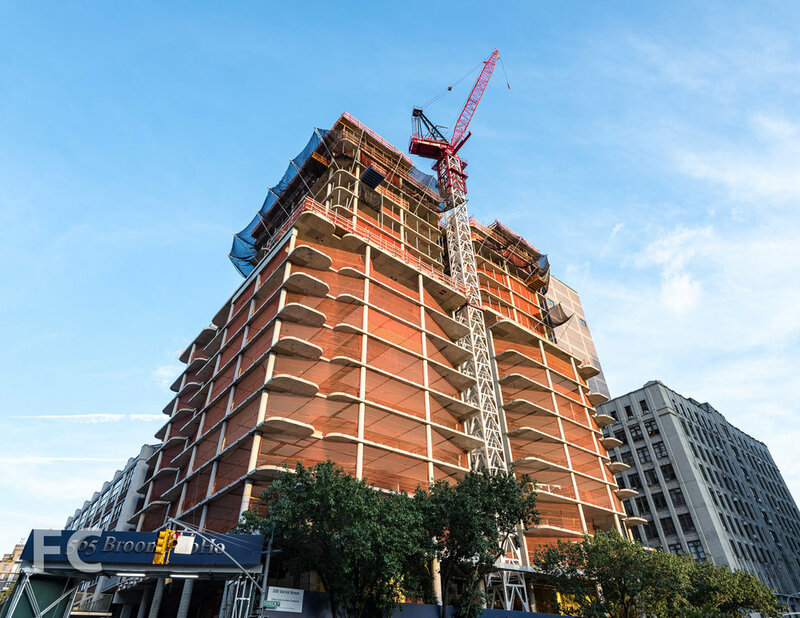 Concrete superstructure has surpassed the 16th floor at 565 Broome Street, a luxury residential development in SoHo from the Italian architecture firm Renzo Piano Building Workshop. Two 30-story towers will share a common podium and contain 115 apartments ranging in size from studios to four-bedrooms. The towers will feature a glass curtain wall with rounded corners, with the first units already installed on the north façade. West façade from Freeman Plaza East. Curtain wall unit installed at the north façade. Close-up of the rounded corner of the curtain wall unit. Architect: Renzo Piano Building Workshop; Developers: Bizzi & Partners Development, Aronov Development, Halpern Real Estate Ventures, Cindat Capital Management; Program: Residential; Location: SoHo, New York, NY; Completion: 2018.